Though their significance in London society is not much discussed in historical study, German merchants had a major impact on social and commercial life in England from the seventeenth through nineteenth centuries. 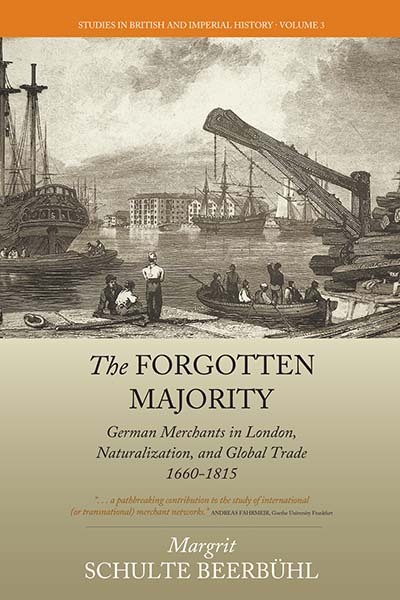 Author Margrit Schulte Beerbühl explores this topic in The Forgotten Majority: German Merchants in London, Naturalization, and Global Trade 1660-1815. Following, the author gives a bit more insight into her love of subject and the work to turn this enthusiasm into a book. What drew you to the study of German merchants in London during this specific time frame (1660-1815)? That period was a black hole in historical research. Academic studies on Germans in London ended with the closure of the Hanseatic Steelyard about 1600 and did not set in again before the end of the Napoleonic Wars. What inspired your love of your subject? It became a puzzle of which the picture only gradually became clearer, putting piece after piece together. Did any perceptions on the subject change from the time you started your research to the time you completed the book? Originally I planned to write a book on the naturalization policy in England. I found a long list of naturalized immigrants with the names of their place of birth and the names of their parents in the eighteenth century. The majority of them were Germans, but there was hardly any reference to their occupations and the reasons why they came to England, nor were there any big and lasting debates on naturalization policy. I was in a cul de sac. I knew that naturalization was a costly affair, and then I had the idea that research into the biographies of the naturalized immigrants of German heritage might tell something about the English naturalization policy. That became an “open sesame” not only to the naturalization policy but also to an up-to-then forgotten majority of several hundred German merchants. What aspect of writing this work did you find most challenging? Most rewarding? The most fascinating discovery during my research was that until then, the prevailing research opinion was that Germany split into a multitude of small states did not participate in the Atlantic economy and colonial trade. My findings revealed that they participated in it by settling in England (most of them in London), making London a place of turnover between Germany, Russia, the Iberian and Mediterranean countries, as well as the USA and the Caribbean. A couple of publications on the settlement and economic activities of German merchants in other European commercial centers and the USA have broadened our knowledge about the expanding world economic between the early modern time and the twentieth century. Still there are many gaps to fill and migrants of other occupations still wait for investigation.